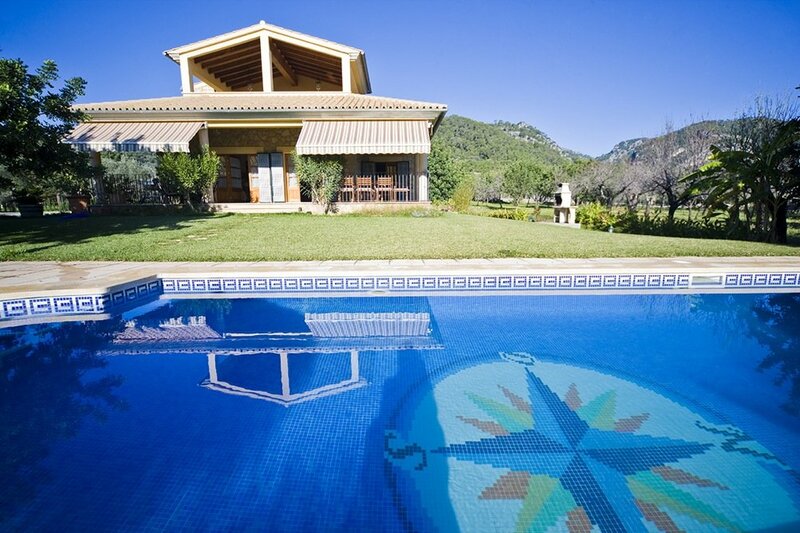 This wonderful villa is situated in the outskirts of the picturesque village Mancor de la Vall in the Tramuntana mountain range. In 2011 the Tramuntana Range was awarded World Heritage Status by UNESCO as an area of great Physical and Cultural significance. The market place, restaurants, shops and the supermarket are within walking distance (max 400 meters) of Villa Binarent. There is a lovely small terrace next to the kitchen for breakfast and a large covered terrace next to the pool area with a lounge and dining table. The glass doors separating the living room from this covered terrace can be moved to one side, opening up the living area. There is a kitchen with a connected indoor dining area. Downstairs there are 2 bedrooms sharing a bathroom and upstairs there are two more bedrooms each with their own en suite bathroom. On the first floor there is a second lounge area with TV and a terrce with sun lounges to read a book and enjoy the fantastic views of the village and the mountains. In the area there are a few fantastic restaurants one of which serves ecological food only. The large swimming pool is surrounded by lawn and there are 8 sun lounges to enjoy the sun. Also there is a large fixed BBQ next the kitchen.